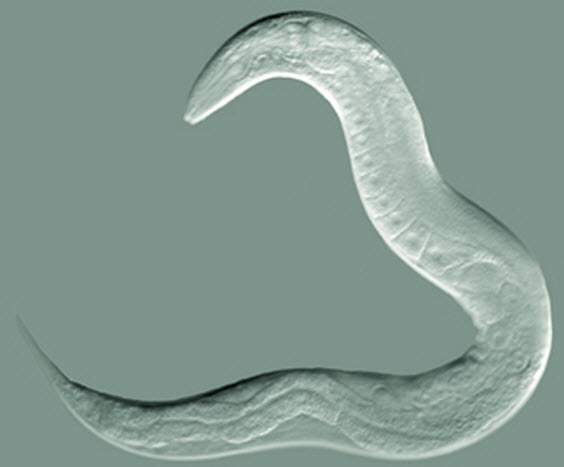 New research published published online in Cell Reports on December 12, 2013 (open access) with the nematode C. elegans suggests that combining mutants can lead to radical lifespan extension. Scientists at the Buck Institute combined mutations in two pathways well known for lifespan extension and report a synergistic five-fold extension of longevity — these worms lived to the human equivalent of 400 to 500 years — introducing the possibility of combination therapy for aging and the maladies associated with it. The mutations inhibited key molecules involved in insulin signaling (IIS) and the nutrient signaling pathway Target of Rapamycin (TOR). Lead scientist and Buck faculty Pankaj Kapahi, PhD, said single mutations in TOR (in this case RSKS-1) usually result in a 30 percent lifespan extension, while mutations in IIS (Daf-2) often result in a doubling of lifespan in the worms — added together they would be expected to extend longevity by 130 percent. “Instead, what we have here is a synergistic five-fold increase in lifespan,” Kapahi said. “The two mutations set off a positive feedback loop in specific tissues that amplified lifespan. Other institutions involved include the School of Public Health, University of California, Berkeley and the Institute of Traditional Chinese and Western Medicine, Huashan Hospital, Fudan University, Shanghai. The work was supported by the National Institutes of Health, the American Federation for Aging Research, and the Hillblom Foundation. Inhibition of DAF-2 (insulin-like growth factor 1 [IGF-1] receptor) or RSKS-1 (S6K), key molecules in the insulin/IGF-1 signaling (IIS) and target of rapamycin (TOR) pathways, respectively, extend lifespan in Caenorhabditis elegans. However, it has not been clear how and in which tissues they interact with each other to modulate longevity. Here, we demonstrate that a combination of mutations in daf-2 and rsks-1 produces a nearly 5-fold increase in longevity that is much greater than the sum of single mutations. This synergistic lifespan extension requires positive feedback regulation of DAF-16 (FOXO) via the AMP-activated protein kinase (AMPK) complex. Furthermore, we identify germline as the key tissue for this synergistic longevity. Moreover, germline-specific inhibition of rsks-1 activates DAF-16 in the intestine. Together, our findings highlight the importance of the germline in the significantly increased longevity produced by daf-2 rsks-1, which has important implications for interactions between the two major conserved longevity pathways in more complex organisms.